It has been a year since I placed a beautiful StickerBrand Wall Decal in our basement living and entertainment room, which we really like. I like how StickerBrand Wall Decals make my space feel special and unique. In our living room on the main floor we have an area that I find difficult to make functional and attractive, so I thought of using a StickerBrand Wall Decal to make this space livelier and to create a focal point. Adding the StickerBrand Wall Decal has immediately transformed this space to become vibrant and gives it the spark it needed. Looking through the beautiful designs of Wall Decals on StickerBrand, I thought of using a white Daisy StickerBrand Wall Decal. First we primed the space and then painted the wall with spinach green paint. 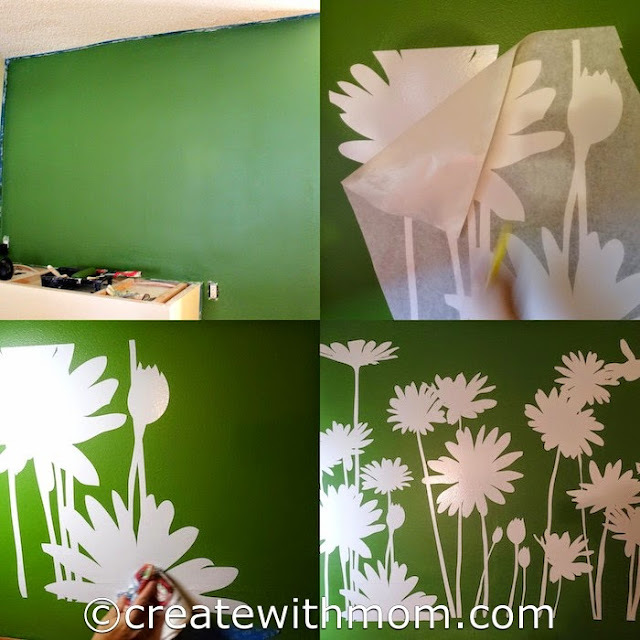 Then we followed the clear, simple to follow step-by-step instructions that came with the wall decal and planned how and where we wanted to place it because once pasted the vinyl wall decals cannot be re-positioned. Before peeling we used a flat craft spatula (thin drywall spatula) to firmly press each decal onto the paper. This helped peel the paper while placing the decal on the wall without the decal coming off. We removed the peel carefully starting from the top in one direction. In some spots we used our fingers to smooth over to ensure the decal sticked to the wall. After the decal was pasted, we used a cloth to wipe over and smoothen the surface. Since I like StickerBrand so much, I am glad I can partner with them to bring you this giveaway. If you are in US or Canada and would like to order your own wall decal in any size or colour for any space for a product value of $70 then enter the giveaway below through the rafflecopter before January 26. Please follow my social media networks and StickerBrand's social media networks to be eligible to win. How is it possible to choose just one?? I am from Newfoundland..I would chose some trees,,or butterflies,,or I dunno,,too many to chose from!..lol. I'm in Canada and I like the Vinyl Wall Decal Sticker Tree Top Branches #444. I'm in Canada. I like the sticker beach wall decal. Canada and I like the Butterfly Flower Floral. Canada and I love the trees! I'm from Canada. I like the Laying Leopard and the Park Tree. I live in Canada and I like the Graphic Wall Vinyl Decal Sticker Giraffe Single! I'm from CAN and I love the Vinyl Wall Decal Sticker Ancient Nautical World Map! I'm from Canada and I like the Sticker Safari Theme Elephant Family wall decal. oh I really love the Vinyl Wall Decal Sticker Tree Top Branches #444. Super awesome for a couple rooms here! I like their Vinyl Wall Decal Sticker Always Do Your Best Quote #5354 and I am from the USA. I am in Canada. Wow, I wouldn't even know where to begin to find my favorite! There are too many great decals. I know my son would love to have one of the guitar ones on his bedroom wall, but I love the ocean waves. Beautiful! I am Canadian. It is SO hard to choose but I like the Tree Top Branches. My daughter would LOVE the fabled fox cus it looks like her Husky that has gone to heaven. im from canada. i love the love with birds and giraffe and giraffe mom decal.